Over seeding is the planting of grass seed directly into existing turf, without tearing up the turf, or the soil . Its an easy way to fill in bare spots, improve the density of turf, establish improved grass varieties and enhance your lawns color. If a lawn looks old, or just “worn out“ If it needs growing amounts of water and fertilizer to thrive , or it’s disease or insect prone, it’s a perfect candidate for over seeding. Over seeding newer turf grass varieties into an older lawn can help it better withstand insects, diseases etc. We recommend having your lawn first aerated or power raked if excess thatch is a problem or lawn compaction for better seed to soil contact which will better the chances of successful germination. We then make two passes with the seed in a broadcast spreader at a 45 degree angle to each other, leaving a diamond shaped pattern. This method results in the seed being placed a maximum of 2 inches apart. Immediately after over seeding, water heavily to help wash grass seeds into slits . Until grass seeds germinate (10 to 14 days). Water lightly on a daily basis, soaking first one inch of soil. Keep soil moist! After grass becomes established, water at the recommended level for the type of grass planted. Depending on conditions the new grass seed will begin to emerge in 5 to 7 days after when moisture and soil temperatures are adequate. 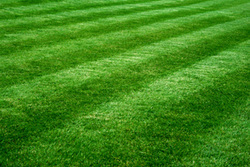 An over seeded lawn can be fully established in eight weeks or less. The key is care and patience. Proper over seeding will produce a healthier, better looking lawn that responds better to mowing, fertilizing, and watering. An added benefit is increased property value!